From a first look, the Solo bag appears to be sleek, though somewhat boxy looking bag. With the boxy appearance, it allows the backpack to store more items — clever! 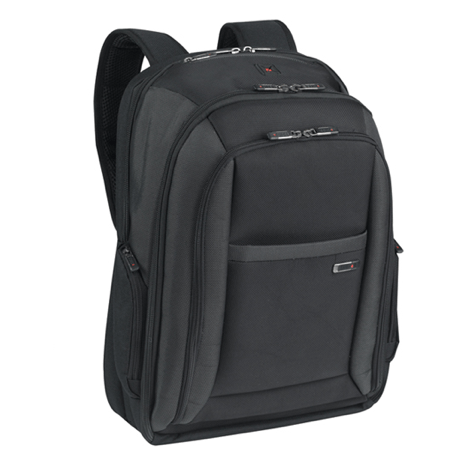 Advantages to the Solo backpack are the amount of compartments and storage of Solo backpack. The Solo backpack is a helpful when needing to carry many items on the go. The compartments on the Solo are spacious and there are many compartments. In the main compartment, there is an area to store your laptop along with a sleeve, with additional space to store files and folders. Additionally, the Solo bag sports more space to store more files and folders. This would be a great bag for a student who carries a fair amount of books to school and needs a laptop. Though the Targus Spruce EcoSmart backpack gives the Solo backpack a run for the money. The straps on the Solo case are extremely comfortable. In addition, the backpack is cushioned to absorb the shock when walking around. When testing, carrying a heavy load feel extremely light. The Solo backpack zippers are on par with the other Laptop Bag Review Week’s backpack. Not one of the zippers malfunctioned or broke. One of the aspects that I favor the most about the Solo backpack is the compartment on the outside. The backpack has an easily accessible area to listen to your MP3 player. The backpack also sports an easy access pocket for on the go purposes. The Solo backpack has tough competition against the Targus Spruce EcoSmart backpack. Both backpacks would do well for a college student who needs to carry a laptop around campus. The durability of the backpack is superb, so you do not need to worry about the Solo backpack breaking.